Occupational therapists look at children from a holistic perspective. 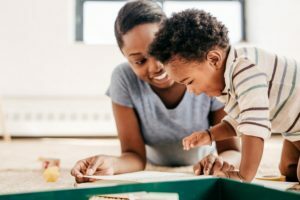 They are trying to determine where delays or limitations are coming from, especially in the areas of fine motor skills, cognitive skills, social development, and establishing self-care routines. Together, these skills lead to children being able to grow into healthy, well-functioning adults. Pediatric occupational therapists typically obtain masters degrees to work with children of all ages – from infants to teenagers. Why Might My Child Need to See an Occupational Therapist? 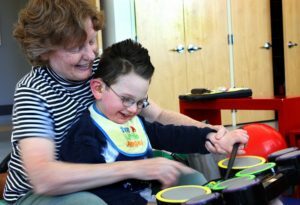 Children don’t like to just sit in therapy, so occupational therapists strive to make therapy sessions feel like play. By participating in motivating activities such as board games, crafts, and building obstacle courses, children are developing skills while having fun! Occupational therapists help children develop these necessary physical, cognitive, and sensory skills so they can perform daily tasks more independently. Remember, treatment options will vary for each child as will duration of therapy. For specific questions about your child, be sure to consult their healthcare provider. Practice fine motor skills in a fun way! 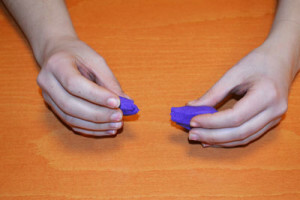 Use putty to exercise your hands and fingers. Occupational therapy isn’t the only kind! Find out what a pediatric SLP is.